(P1) South African sprinter Wayde Van Niekerk set a world record Sunday night in the men’s 400-meter race. It’s an Olympic feat that the Washington Post says, “no one saw coming” except, perhaps, for the 74-year-old Namibian great-grandmother who trains him. 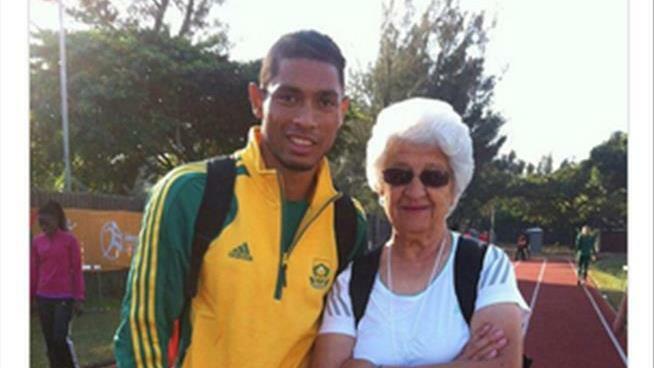 Van Niekerk first caught the eye of Ans Botha, who’s been a track and field coach for half a century, at 2010’s IAAF World Junior Championships. She started coaching him two years later, Quartz notes. He’s managed to get four seconds faster in the 400-meter competition since she took over his training regimen. Would you like to be able to run as fast or faster than Van Niekerk? Why do you think Ans Botha is still coaching? Are you disciplined and focused on your goals? Why or why not? Which event did the runner set a world record in? How old is Ans Botha? How long has the great-grandmother been coaching? What’s another name people call Ans Botha? 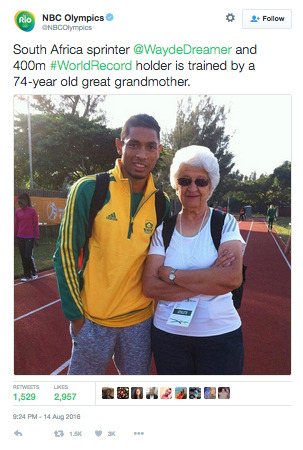 What’s the name of Van Niekerk’s teammate?